Melanie Kelly: this draws on material in the forthcoming book Take Flight which will be published by Bristol Cultural Development Partnership as part of the BAC 100 celebrations in July 2010 as well as work from a previous BCDP project, Brunel 200 in 2006. The West of England has provided the expertise, workmanship and financial backing for centuries of transatlantic crossings, dating back from the time of sail and steam to the 'Bristol'-engined Empire flying boats, BAC's Britannia and British Aircraft Corporation's Concorde and continuing today with the Airbus fleet. Among the first people to travel westwards across the Atlantic were Bristol fishermen searching for new waters in which to cast their nets in the fourteenth and fifteenth centuries. At that time, Bristol was famous for making high-quality, well-built, sea-worthy ships. Since the early medieval period Bristol's wealth had been based on trade. Many of the city's merchants became wealthy and influential figures. They invested part of their fortunes in voyages of discovery, of which the most famous was that of Venetian explorer John Cabot. Cabot set sail across the Atlantic from Bristol on 20 May 1497 in his ship Matthew in search of a westward passage to the riches of the East Indies and Asia. By that time many people, particularly those with experience of sailing long distances, knew that the Earth was round but they were not yet aware that the continent of America lay between Europe and the East. Cabot landed at the large island that we now know as Newfoundland on June 24 1497. He and his crew were probably the first Europeans to stand on the shore of North America. Bristol merchants became increasingly involved in such endeavours and in developing links across the Atlantic in what was then called the New World. This activity helped make Bristol one of the richest cities in England. In 1701 Bristol owned a fleet of 165 merchant ships, and weaving, ship-building, sugar-refining, and the manufacture of soap, tobacco and other trading goods were flourishing in the city. In addition to the traditional Atlantic trade in dried fish from Newfoundland and Iceland, there also developed the infamous triangular trade between Bristol, Africa, and the Caribbean and American colonies. Trinkets, cloth and other domestic goods were traded for enslaved African people who were traded in turn for rum, sugar and tobacco. This trade was abolished in 1807. Bristol entered a slow decline as a trading port in the nineteenth century and would gradually lose its pre-eminence in shipbuilding, but the city did provide the base for two ambitious maritime engineering projects with Atlantic connections; Isambard Kingdom Brunel's PS Great Western and ss Great Britain. Brunel aspired to build an integrated transatlantic route from London to New York with passengers arriving in Bristol by railway, transferring by coach to the docks where they would board an ocean-going steamship. Brunel's friend Thomas Guppy, a Bristol engineer and businessman, brought together the partners that formed the Great Western Steamship Company to deliver this scheme. Guppy had been instrumental in establishing the Great Western Railway. Brunel's first venture for the new company was the Great Western. The ship was built by the firm of William Patterson, a leading Bristol shipbuilder, with steam engines provided by Maudslay, Sons and Field in London. She was an oak-hulled paddle steamer and the first steamship to provide a regular transatlantic service, heralding a new era of ocean-going transport. The ship was launched in July 1837 from Wapping (now Prince's) Wharf and moved to London for fitting out. On her return trip to Bristol, fire broke out in the boiler room and Brunel was injured when he fell nearly six metres from a burning ladder to the flooded boiler room floor. When the Great Western left Bristol for New York, 50 of her original 57 paying passengers had cancelled their tickets as they considered her too risky to travel on. The Great Western Steamship Company's main competitors in the race to develop a transatlantic steam line was British and American Steam Navigation, a London-based group led by an expatriate American businessman called Junius Smith. As a publicity stunt, Smith sent the channel steamer Sirius to cross the Atlantic in competition with the Great Western, leaving Cork on 4 April 1838. The Great Western left Bristol on 8 April 1838 and arrived in New York 15 days later, only 12 hours behind Sirius with 203 tons of coal to spare (a sailing ship would have taken a month). In 1839 Bristol's Royal Western Hotel was opened to accommodate passengers stopping off en route between the docks and Temple Meads station. However, the Great Western service transferred from Bristol to Liverpool so the city lost this business opportunity. Of perhaps greater significance for world travel was the Great Western's sister ship, the ss Great Britain, launched on 19 July 1843, the largest and most powerful ship to have been built at that date and the first propeller-driven, steam-powered iron ship to cross the Atlantic. Symptomatic of the difficulties Bristol faced in its ambition to be a major modern port, the locks of the Cumberland Basin that the Great Britain needed to pass through in order to leave the city proved to be too narrow for the ship. Brunel had to carry out widening work and the ship remained in Bristol until 11 December 1844. The Great Britain was the forerunner of modern passenger liners, making regular voyages to the USA and Australia. 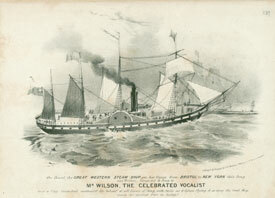 As with the Great Western, the Great Britain mainly operated from Liverpool after her launch from where she made her maiden voyage to New York. On 23 September 1846 she ran aground at Dundrum Bay in Ireland. It took nearly a year to refloat her by which time the Great Western Steamship Company was bankrupted and she was sold to Gibbs, Bright and Company. At times of war she served as a troopship, travelling both to the Crimea and to India. In later years, she was converted to a sailing ship for carrying coal from Wales to San Francisco. Following storm damage off Cape Horn in 1886, she struggled to the Falkland Islands where she was used as a storage hulk for wood and coal. She was beached in Sparrow Cove in 1937. In 1970 the Great Britain was towed home to Bristol where now, partially restored to her former glory, she is a major tourist attraction, dry-docked in the Great Western Dockyard that was originally created to build her. She is probably rivalled only by the Clifton Suspension Bridge and Concorde as a visual icon of the city. Brunel's final maritime venture, the ss Great Eastern, was developing at Wapping in the East End of London. Years later historian Keith Brace compared this technologically advanced but financially doomed ship to BAC's Brabazon. It was 'a pioneer on the grand scale born a generation too soon for its environment'. 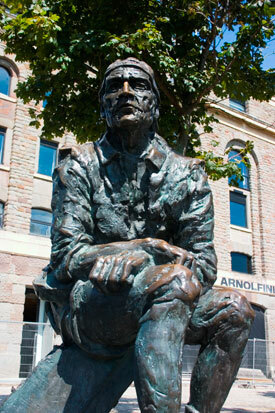 Statue of John Cabot at Bristol's Harbourside, c 2005 (Destination Bristol, photograph by Graham Parish). 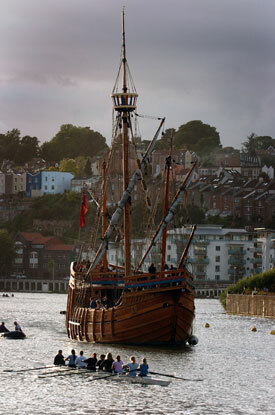 Replica of the Matthew at Bristol, 2005 (Destination Bristol, photograph by Graham Flack). Detail from cover for the songsheet for 'Farewell Awhile my Native Isle', a song composed and sung on the Great Western's maiden voyage to New York from Bristol, 1838 (Special Collections, Bristol Central Library). 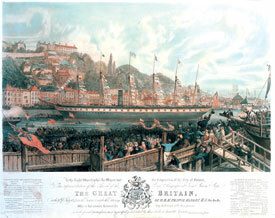 Print depicting the launch of ss Great Britain at Bristol, 1843 (ss Great Britain Trust).